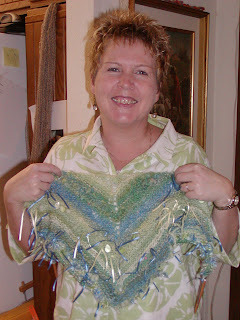 Linda Searcy from Olympia, Washington, visited this week and fell in love with my freeform yarns. 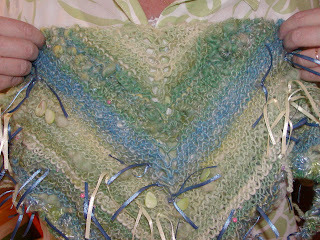 Above and below is the shawl that she started knitting from the Monet Waterlily Series of freeform novelty yarn that I spun. As a spinner, she was fascinated and she jumped at the chance to take my class, so she got an individual lesson on Friday. She was incredibly patient as I jumped up to help customers and ran out to feed Desert (Rambouillet lamb) his bottle every so often and check on future moms. No babies still! 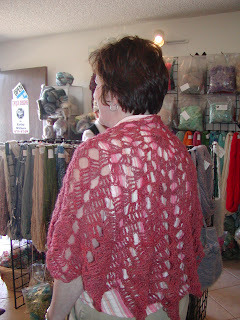 I just finished this shawl and hung it in the shop this morning. It already has a new home. Very exciting for me, except for having to make a new one to replace it. I have written a pattern for this shawl and it is selling very well on etsy, as well as in the shop.I started a green and black kid mohair one that I am already falling in love with.My favorite yarns are the ones where the colors continue to shift and this yarn does. 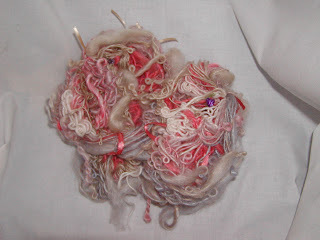 I sold Linda's mother a wet skein of novelty yarn that has about the same colors as this yarn shown below. 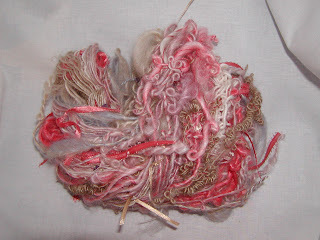 I would list this yarn on etsy, but think it will sell quicker in my shop. Photos don't do it justice. Anyhow, after teaching the class, I had to spin some myself! Coral is definitely going to be in.